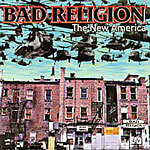 But with "The new America" they seemed to have found their old drive and released a cracker of an album, producing some classic songs in the making - the title track should be the US number 1 single if there's any justice in this world. And 'A streetkid named desire' is worth the price of the CD alone, a powerful story of rising up to beat one's situation, finding self-confidence and taking the world on its own terms. There is much here to celebrate for the long-time BR fan. A return to form, and no mistake.